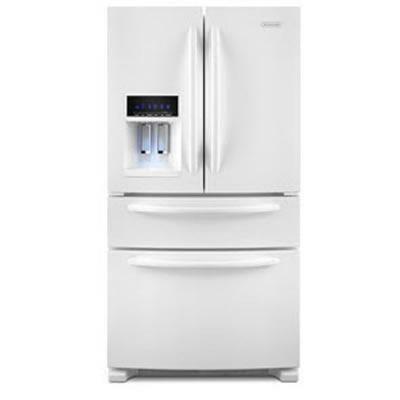 Refrigerator 18.40 cu. ft. / 0.52 cu. m.
Freezer 6.61 cu. ft. / 0.19 cu. 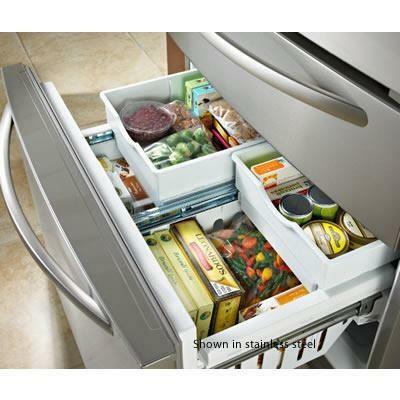 m.
Technologies FreshChill™ Temperature Management System helps maintain food freshness; FreshVue™ Refrigerated Drawer holds more fresh food in more ways than ever. 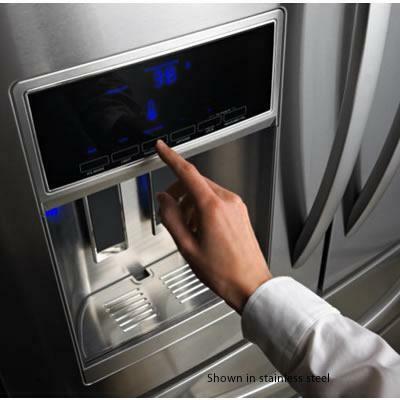 Additional Information Ramp-up internal LED lighting gradually increases in intensity and keeps the refrigerator brightly and crisply lit; Adjustable glass shelves with Spill Shield technology feature a sleek design to help contain the largest spills; Through-the-door ice & water dispenser provides quick and easy access to the automatic ice maker and chilled water. Additional Dimensions Depth with handle: 34-11/16". Warranty 1 Year. 5 years on cavity liner; 10 years on sealed refrigeration system.